Like any proud dad, Andrew Scott loves to take pictures of his son, seven-year-old Ben. There’s Ben running around a field playing catch with his three sisters; Ben screaming with delight on the water ride at an adventure park; Ben sitting on the back step, splashing a bucket of water. But over the past three months Andrew’s photography has become something of an obsession. He has taken literally hundreds of pictures of Ben, trying to capture every day of his son’s life, part of a project he calls the Book Of Ben. Two months ago Andrew and his wife Lyndsay, who live in Yeovil, Somerset, were told their son has a form of dementia. At just seven, Ben is facing the kind of harrowing decline we associate with old age. But he’ll be lucky to live to 20. Already, his speech is slurred, and within a few years he will be unable to walk, speak or recognise those closest to him, trapped in his immobile body, unaware of anything around him. His parents will only be able to look on as their lively boy slowly but inexorably fades. 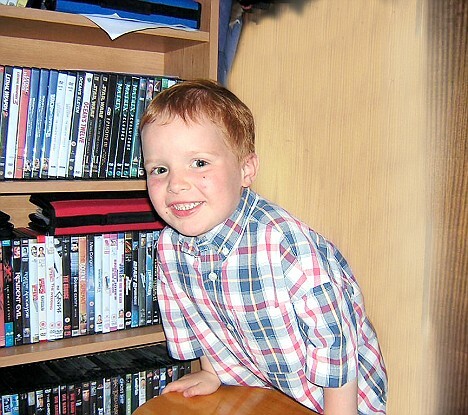 Ben’s condition has been caused by Niemann-Pick, a rare genetic disorder which affects only 500 children worldwide. It occurs as a result of the build-up of cholesterol in all the body’s organs, including the brain, effectively stopping them from performing their job, causing a progressive loss of mental faculties as well as problems with movement. ‘I don’t know which is harder, that Ben is going to die, or that it will get to the stage where Ben won’t know who I am,’ says Lyndsay, 30, a full-time mother. What makes the disease even more cruel is that the pace of deterioration is so unpredictable. But already over the past year the changes have begun to speed up, explains Andrew, 33, a sales manager. To make matters worse, the genetic condition might also affect their daughter Lucy, who is 18 months younger than Ben. Doctors have not yet been able to pinpoint the exact form of gene mutation Ben has. Until they do, they cannot test Lucy – it is a case of watch and wait. Lyndsay had known from early on that there was something wrong with Ben (she has two other daughters, Gemma, 12, and Charlotte, ten, from a previous marriage). ‘We were seen as panicky parents,’ adds Andrew. ‘But we were sure something was wrong. Ben’s teachers expressed concern, so the Scotts contacted their local child development centre. After an eight-month wait, they saw an occupational therapist, who referred Ben, then five, to a paediatrician. When the paediatrician saw Ben seven months later, again the Scotts were told there was nothing to be concerned about, that his development was just a little bit delayed. But over the next year Ben fell more and more behind at school. At six, when other kids were reading and writing, Ben still couldn’t hold a pen because his fine motor skills were so poor and he could only recognise the letters B and E. He was also losing his ability to run and had become incontinent. On April 29, Ben met Dr Philip Jardine at Bristol Children’s Hospital and was admitted for scores of tests including an MRI scan, and bone marrow, muscle and skin biopsies. Two weeks later Dr Jardine rang with the results. ‘He said he couldn’t talk over the phone but that we should come and see him as soon as possible,’ says Andrew. There are three forms of Niemann-Pick Disease: Type A, B and C. Each affects the way the body breaks down fat and are caused by genetic mutations passed down from the child’s parents, who must both be carriers of the defective gene but may have no symptoms themselves. Type A rapidly affects the brain and usually causes death before the age of three. Type B affects the liver, spleen and respiratory system and sufferers can survive into adolescence or adulthood. Type C, which Ben has, is the most common. Because of a faulty gene, the body doesn’t produce the enzyme needed to break down cholesterol. The build-up in the organs, including the brain, liver and spleen, causes a massive deterioration, leading to mental and physical problems (unlike adult dementia sufferers, whose problems are largely mental). The Scotts have done all they can to find out more about the condition and what the future holds for Ben. But because it is so rare, it’s hard to gather information. But the condition has a certain pattern – the cholesterol around the brain starts to disrupt the signals to do with movement, affecting coordination. Ben already falls over a lot and finds it hard to walk. Eventually, he won’t be able to swallow properly and food will get into his lungs, raising the risk of pneumonia, so he will need to be fed through a tube. In some cases, the cholesterol around the liver can cause liver disease. His memory will start to fade as his brain function deteriorates. Then he will suddenly lose the ability to walk, talk and feed himself. In the final stages the sufferer is immobile and unaware of the world around them. As with adult dementia, there are currently trials into drugs that might help symptoms, but there is no cure. ‘Right now his symptoms are a bit like he’s drunk a bottle of vodka,’ says Andrew. ‘It’s quite hard work for him to do anything, even very small things. A small walk takes a lot out of him. ‘But eating is the area we really need to watch at the moment. He puts food in his mouth but he forgets to chew. We have to rub his mouth to remind him. The only blessing in all this is that Ben doesn’t understand what’s going on – because of the disease, intellectually he’s never advanced beyond the age of four, and he now attends a school for children with special needs. But he is a happy child. ‘Most of the time Ben is a very content little boy,’ says Lyndsay. ‘But sometimes he gets frustrated when he can’t do things he used to do. He loves building towers out of wooden blocks, but as he gets older and his skills become less, he’s finding it harder and harder to build the towers; they keep falling down. ‘Other times he’s like a normal little boy. We take him to an adventure park where there’s a log flume water ride and he loves it. He really loves the thrill, the adrenaline. His face lights up just like any other seven-year-old. It’s hard. The other day I was in the supermarket and I had tears streaming down my face. Some days it’s overwhelming. The only practical thing the Scott family can do is raise awareness of the condition so that other families don’t have to wait years for a diagnosis. ‘Having a diagnosis has made a huge difference, it’s meant we can get him all the help he needs,’ says Lyndsay. The Scotts still get upset thinking about the days he was in a mainstream school, sitting in dirty nappies, unable to take part in what was going on around him. These days they do all they can to make the best of every day. ‘I find myself constantly looking at his face when he smiles, so I can remember him that way,’ says – Lyndsay. And with that, Andrew strokes his darling boy’s legs and takes another photograph. • For more information contact the Niemann-Pick Support Group (UK), 0191 415 0693 www.niemannpick.org.uk.